Editor's note: this transcript was created from the broadcast quality audio recording program featuring Professor Ilan Pappé recorded by Jeff Blankfort and produced by Maria Gilardin for her weekly radio program, Time Of Useful Consciousness. This transcript combines Maria’s Introductions and Professor Pappé’s presentation. Thanks to Jeff Blankfort for the recording he produced and to Maria Gilardin for her permission and encouragement to put together this presentation. TUC aka Time of Useful Consciousness is an aeronautical term. The time between the onset of oxygen deficiency and the loss of consciousness, the brief moments in which a pilot may save the plane. Professor Ilan Pappé is the best known member of Israel’s generation of “new historians.” They have been rewriting the history of Israel’s founding in 1948. Thanks to the declassification of British and Israeli documents in the 1980s Pappé has dedicated himself to exposing the myth around what Israel calls its war of independence. That war led to the ethnic cleansing of three quarter of a million Palestinians and the destruction of over 500 of their villages in what is now Israel. That’s described in Pappé’s seminal book, The Ethnic Cleansing of Palestine, published in 2006 while he was chair of the Institute for Palestinian and Israeli Studies at Haifa University. The publication led to personal attacks on him in the Israeli Knesset and in Israel’s academia. After threats on his person, Pappé left Israel in 2008 and was welcomed at the University of Exeter in Britain. There he is currently the Director of the university’s European Center for Palestine Studies. At the time of partition, the Jewish population owned less than 6% of Palestine. When Israel declared its “independence,” in 1948 it came into existence on 78 percent of historic Palestine, a percentage it has steadily increased in subsequent years, a process that continues today. In 1967, Israel occupied the remaining 22% of historic Palestine: the West Bank and Gaza (as well as large sections of Syria and Egypt). Since then, through financial incentives, Israel has encouraged its citizens and Jewish immigrants from abroad to move into occupied Palestine, creating exclusively Jewish “settlements” which are illegal according to the Fourth Geneva Convention. Today 40% of the Palestinian West Bank is off-limits to Palestinians. While still living in Israel, Pappé initiated the annual Israeli Right of Return conferences. They called for the unconditional right of return of Palestinian refugees who were expelled in 1948; many of them still live in refugee camps in Lebanon, Jordan, and Syria; but they have not given up hope of returning to their homeland. For all this Ilan Pappé has not only been attacked but has gained the respect of the younger generation of activists and that of notable writers, among them the international journalist and film maker John Pilger. Pilger calls him, “Israel’s bravest, most principled, most incisive historian.” And Noam Chomsky recently co-wrote a book with Pappé: Gaza in Crisis: Reflections on Israel’s War Against the Palestinians. (2010). The May 2016 speech by Ilan Pappé: Palestine is Still the Issue, that you are about to hear, explains Pappé’s positions including his remedy. Far from being despondent about the state of the so-called peace process between Palestinians and Israelis, Ilan Pappé—on this issue as well as on war crimes, the boycott of Israel and Palestinian and the right of return—offers a very principled solution. Since Israel has already annexed almost all of Palestine, there is no longer an option for a two state solution. Pappé says the solution is One State for all its inhabitants and he lays out some of the basics. 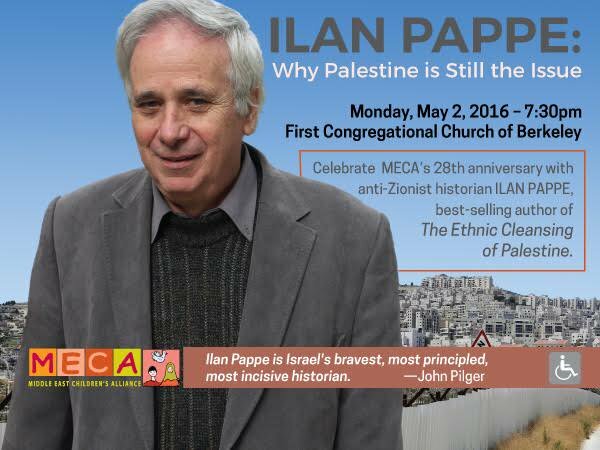 Ilan Pappé spoke on May 2, 2016, at the First Congregational Church in Berkeley, California. He was the keynote speaker at the anniversary celebration of the Middle East Children’s Alliance, MECA (mecaforpeace.org), a nonprofit humanitarian aid organization based in Berkeley. Since 1988 MECA has provided more that $21 million in food, medicine, medical supplies, and clothes, as well as books, toys, and school supplies to children and families in Palestine, Iraq, and Lebanon. In his ground-breaking book, The Ethnic Cleansing of Palestine, Ilan Pappé accuses the state of Israel of forcibly driving out over 750,000 Palestinians between 1948 and 1949. As part of the long-standing Zionist plan, to manufacture an ethnically pure Jewish state, his book had a profound effect on me and on all the Palestinians in the Diaspora. Because it acknowledged and recorded with honesty and courage our loss and displacement. I am the daughter a Nakba Refugee. I too, was fortunate enough to have a mother who instilled in me her love of Palestine. Three years after her death, this past summer in Jerusalem, I finally managed, for the first time ever, to enter my Mother’s house, now inhabited by an Israeli family. I could have shut my eyes and walked from room to room without running in to any walls. My Mother’s memories had become my own. Thank you very much. It’s a great honor to be a keynote speaker in an event on behalf of MECA. I was introduced to MECA many years ago when one of my sons told me, ‘There is a bus that came to visit us.’ And they all entered our house. Since then I followed very closely what MECA is doing and it’s a great honor to support this sacred work. I also want to thank Mona for this very moving introduction. It’s always rewarding to hear Palestinians refer to The Ethnic Cleansing as an affirmation of their own trials and tribulations in a way that I think also opens some hope for the future. Tonight’s title comes under the headline of “Palestine Is Still The Issue.” When I say that Palestine is still the issue I don’t mean that for anyone who sits in this hall—or for me—Palestine ever ceased to be the issue. We don’t have to be lectured in any way or persuaded that Palestine is still the issue. Every day brings with it a different image that reminds us that Palestine is still the issue. So we don’t need to be reminded that Palestine is still the issue. But I think you understand that the context of this talk is different. A lot of people would tell us, that given what’s going on in Syria, in Iraq, given the magnitude of the refugee issue in Europe, the economic problems in the United States, Palestine has been marginalized as an issue of global attention and you cannot galvanize anymore people to see Palestine as a central issue of humanity and inhumanity. Palestine is the only active, remaining act of Settler Colonialism and therefore it is representing the struggle of indigenous people and native people all around the world. And I think it is important to remind ourselves why Palestine, in this respect, despite all the horrific things that are happening in Syria and Iraq, in Libya and Yemen, and despite the problems facing refugees in Europe and here as well, despite all of these distractions, if you want, it is important to remind ourself that Palestine is the issue because much of what we see in the Middle East and outside the Middle East, is connected to what happened in the past in Palestine and what happens today in Palestine. So in this respect, if you are still committed to Palestine with all you heart, most of your activity is on behalf of the Palestinians and for the Palestinians, you are also acting on behalf of everyone else who nowadays suffers in the Middle East and beyond the Middle East from crimes against humanity. Palestine is the issue for five major reasons and I would like to point out each one of them. Palestine is still the issue today because morally it is the last and only remaining struggle of indigenous native people against Settler Colonialism that is still very active. Palestine is not the only country where Settler Colonialism was visited upon. This very country we are in was one of the first projects of Settler Colonialism; Australia, New Zealand, South Africa. But in all these other countries where Settler Colonialism was definitely prevalent in the past, at least processes of change and transformation were taking place. Settler Colonialism as you may know, is the movement of desparate Europeans outside of Europe because they were persecuted there; because they felt that Europe was unsafe. And they went to other countries, to other continents. And when they arrived in those new places, they found an indigenous native population. Because they were persecuted, because they were looking for one-way ticket out of Europe, they felt that they don’t only want to make the new country a home, but also to make it a homeland. The obstacle in the way of making a new place a homeland were always the indigenous native people. In many cases, the result of this clash between the wish to create a new homeland and the fact that someone else already lived there for centuries, was genocide; elimination of the native people. We have to remind ourself, and remain hopeful, that Palestine is still the issue because people were not genocided there. Because there in Palestine the logic of elimination that informed settler colonialism in this country was terrible enough, but was not genocide. People were expelled. Villages were destroyed. The country was de-Arab-ized and Jude-ized. But the struggle continues because the people are still there. Because not all the country has been de-Arab-ized and because the people themself have not lost the struggle and the wish to go back to their homeland and those who are in their homeland have not lost the aspiration to make it, once more, their beloved homeland. So this is a struggle that brings together the evils of settler colonialism in the past with the evil of colonialism in the present. In this respect, if we want to be part of a better world—that understands that European settlers wreaked havoc, genocide, apartheid, ethnic cleansing all around the rest of the world—it is in Palestine where we can still rectify some of that evil by showing that there is a way towards reconciliation as was done (at least partly) in post-apartheid South Africa. Morally, Palestine is the place where the logic of elimination is still at work daily against the Palestinian people and everyone who experienced it here in the past, or still thinks about it, can see in Palestine a place where this logic should be rejected and replaced by humanization. Settler colonialism is also a human project that was motivated by de-humanization. People who were chased out of Europe and arrived in the place where someone else lived were usually poor people, persecuted people, victims of ethnic cleansing themself. And in order to justify their transformation into victimizers themself they had to de-humanize the native people; they had to de-humanize the indigenous people. Zionism in Palestine is this lethal fusion of these two logics that still operates in 2016, where Palestinians are de-humanized and therefore are an object of elimination. Elimination is not always physical genocide. You can be eliminated by being enclaved and besieged in your own village without the right to move. You can be eliminated by being expelled within your own homeland to another place. You can be eliminated by being robbed of all your civil rights, either to vote or to be elected in a way that can have an impact on your own future. In this respect, we are witnessing daily the experiment of settler colonialism in Palestine motivated by these two logics, of de-humanization and elimination and if we are against such inhumanity then Palestine should be the issue for us. Palestine is also the issue because it has been connected and associated in the most wrong way possible with anti-semitism. For so many years we were lead to believe that the colonization of Palestine was the antidote to anti-semitism. Europe, the United States, and the West in general, used to convince themselves and others that because there was a problem of anti-semitism, and its worst chapter was in Europe during the holocaust, the only way to solve the hatred towards Jews because they are Jews was to allow them to colonize Palestine and dispossess the Palestinians. This irrational, this cruel logic, that is at the heart of the connection between Zionism and anti-semitism still fuels most of the support Israel gets in this country, and still is the main ammunition pro-Israeli groups and individuals use in this country to silence any criticism on the Jewish state and its criminal policies. Therefore, Palestine—that’s the second reason that Palestine is still the issue because the Jewish problem of Europe, the Jewish problem of the West, is a universal problem. Because it is not only the problem of the Jews. The genocide of the Jews in the Second World War showed the cruelty of modernity, of European Enlightenment, of the aspirations of Europeans to be culturally, morally, and politically superior to any other civilization. We need the closure to that terrible chapter in the history of humanity. Allowing Jews to colonized Palestine and dispossess the Palestinians is not the answer to this problem. Palestine is still the issue because it is connected, also, to Islamophobia. It has a long history of connection to the fear of Muslims just because they are Muslims. The Balfour Declaration, in which Britain gave something that didn’t belong to it to a movement it didn’t belong to ... the two motives for the British Empire, to take part of the Middle East, part of the Arab world, part of the Muslim world, and to grant it to a new ideological movement and promise that the empire would do its utmost to create a homeland there, the two major motives were, surprisingly, anti-semitism and Islamophobia. There was a fear of Islam, there was a fear of Muslims, very much at the heart of the British policy makers who were about to take the Middle East as a new possession in their empire that already was very big and they much preferred to have non-muslim enclaves and kingdoms if they could in their new domains, in their new possessions. At the same time, it was a double bill as far as the Jews were concerned. Here were a group of Jews who came to them and said, We want to leave Europe and to colonize Palestine. This was good news for someone like Arthur Balfour, the British Foreign Secretary. He could see how he could get rid of the Jews and at the same time have a non-Muslim British colony in the Holy Land which he hoped one day would be restored to the glory of the days of the Crusaders. So, Islamophobia, in many ways, or put it differently, Palestinians were the first victims of Islamophobia in modern times. They are also the last victims of Islamophobia in our times. It is the fear of Islam, it is the hatred of Islam, it is the animosity to Muslims just because they are Muslims that helped Israel to stop almost a natural process in the United States at the very end of the last century in which Americans, because of the easy access to information, to knowledge, began to understand what was going on the ground in Palestine. It was the major tool by which Israel, after 2001, associated terrorism with Palestinians in a way that stifled any proper discussion about Israel, Zionism, and Palestine in this country. And we are witnessing it again and again, the attempt to associate violence that is carried out by desparate people in Europe and their supporters with justification for the state terror that Israel exercises against the Palestinians. So if you have a discussion about Palestine, you have a genuine discussion about terror. Not a false discussion about terror. You have a genuine discussion about the causes of violence in the Middle East, in Brussels, in Paris, in the United States, and everywhere in the world. You have a much better conversation of how Palestine is connected to desperation, to violence, if you focus on that country and you don’t allow the conversation about terror and the Islamophobic discourse to stifle any genuine discussion about the systematic structure violation of human rights against the Palestinians that has started in the late 19th century and has not stopped for even one day. That was the first part of a 45 minute speech by Ilan Pappé, Israeli historian, and currently Director of the European Center for Palestine Studies, at the University of Exeter in Britain. He was the keynote speaker at the May 2016 anniversary celebration of the Middle East Children’s Alliance, MECA, a nonprofit humanitarian aid organization based in Berkeley, California. 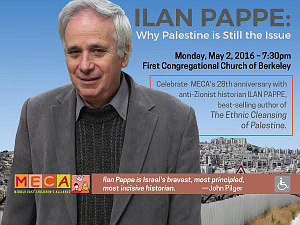 Ilan Pappé was recorded by Jeff Blankfort on May 2, 2016, at the First Congregational Church in Berkeley, California. Come back for the conclusion when Pappé explains how Palestine is connected to the international, universal issues of social justice and human rights. This is the conclusion of a thought provoking 45 minute speech by the Israeli professor Ilan Pappé. He spoke in Berkeley, California, in May 2016, at an anniversary of the Middle East Children’s Alliance, a nonprofit humanitarian aid organization. They provide food, medicine, books and school supplies to children and families in Palestine, Iraq and Lebanon. 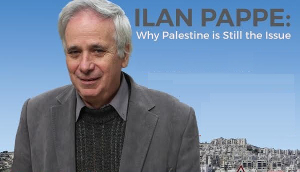 Ilan Pappé is the author of many books, among them: The Idea of Israel: A History of Power and Knowledge (New York: Verso, 2014), The Bureaucracy of Evil: The History of the Israeli Occupation (London: Oneworld, 2008), “The Boycott Will Work: An Israeli Perspective” from The Case for Sanctions Against Israel (London: Verso, 2011), and The Forgotten Palestinians: A History of the Palestinians in Israel (New Haven: Yale University Press, 2011). The 1948 Palestine-Israel War is known to Israelis as ‘The War of Independence’, but for Palestinians it will forever be the Nakba, the ‘catastrophe’. Alongside the creation of the state of Israel, the war led to one of the largest forced migrations in modern history. Around a millions people were expelled from their homes at gunpoint, civilians were massacred, and hundreds of Palestinian villages deliberately destroyed. Though the truth about the mass expulsion has been systematically distorted and suppressed, had it taken place in the 21st century it could only have been called ethnic cleansing. Prominent Israeli academic Ilan Pappé argues passionately for the international recognition of this tragedy. For Pappé the publication of the book eventually brought about his “exile” so to speak from Israel. There were personal attacks on him in the Israeli government and academia. He left Israel in 2008 and began teaching at the University of Exeter in Britain. There he is currently the Director of the university’s European Center for Palestine Studies. In Part One of this talk, Pappé introduced the term Settler Colonialism. As opposed to Colonialism where land is occupied and resources extracted but in the end the colonizers go back home, in the new movement of Settler Colonialism the settlers come with a one way ticket and make the occupied land their home. According to Ilan Pappé and the author Patrick Wolfe this occurred in South Africa, Australia, New Zealand, Israel, the United States, and elsewhere. In order to clear the land for the new settlers the indigenous peoples were killed, expelled, or forcibly assimilated. Pappé said in his May 2016 speech in Berkeley that it is very important to talk about Settler Colonialism in the US. Many of the new settlers escaped from Europe because they were persecuted. How was it possible for these formerly persecuted groups to become the oppressors of native Americans in turn? And in Israel, where Ilan Pappé was born in 1954, the formerly persecuted Jews are now the oppressors of Palestinians. And, in a huge historic irony, the old Settler Colonialist state of North America protects the new Settler Colonialist State of Israel from being held responsible for human rights violations. While the US still needs to come to terms with it’s own Settler Colonialism, that task for Israel—ironically—is somewhat simpler. While in the US—depending on the source—70 to 90% of the indigenous population was killed, the ethnic cleansing of what is now Israel did not involve large scale genocide. About 7 million Palestinians are still living in refugee camps or have found temporary homes in other countries. It is not too late to do justice by them and Ilan Pappé lists five assumptions or concepts that support his statement that Palestine is still the Issue. He develops a project to bring about justice, respect for human rights, and mutual understanding. In Part One he spoke of anti-semitism and mentioned the claim that the colonization of Palestine was the antidote to anti-semitism. Pappé says that it is indeed a terrible logic at the heart of the connection between Zionism and anti-semitism that is now used to silence any criticism of Israel. In Part One Pappé also points to the history of Western Philosophy. He calls out the cruelty of modernity and of the enlightenment. It was the enlightenment that defined the claim of European/White superiority to any other civilization. In the Settler Colonialist project this superiority over all indigenous cultures, ironically once included a superiority over Jews and was used to justify the holocaust. Finally, also in Part One, Pappé points to the problem of Islamophobia. When Britain, in the Balfour Declaration of 1917, took part of the Arab World and promised that the British Empire would do its utmost to grant a Jewish homeland there, the two major motives were both anti-Semitism and Islamophobia. The British liked the idea of Jews leaving Europe due to British anti-Semitism, and they looked forward to having a Western outpost in the middle of the Arab world due to British Islamophobia. Here now is the conclusion of the talk by Professor Ilan Pappé, Palestine Is Still The Issue. He begins by addressing social justice and human rights. Palestine is still the issue because it is also an issue of social justice. It is not surprising that you can see, in various parts of the world, workers who would demonstrate for better pay, for better conditions, who are engaging industrial action, you will not be surprised to see them don themselves with the Palestinian flag. Because for them, Palestine is the ultimate symbol of injustice. Not only national injustice, not only political injustice, but also social injustice. And you have to ask yourself, Why Palestine? Why is the Palestinian flag such an emblem for struggles who at least on the face of it, have nothing to do with Palestine? And then you understand that it’s not because these people think that the atrocities committed against the Palestinian are the worst. Not because they don’t know about other cases of inhumanity. Not because they have singled out Israel as the worst rogue state in the world. They are much—they are very familiar with worse rogue states that exist. They are very knowledgable of other inhumanities which are far worse than what the Palestinians have ever experienced and hopefully would ever experience. It’s not out of ignorance that they decided that the Palestinian flag symbolizes a struggle for social justice. Social justice, more than anything else, is a struggle against double talk, against hypocrisy, against exceptionalism, against deception. And no other case of violation of human rights and civil rights can compare with the case of Palestine when it comes to exceptionalism, deception, and double talk. This is something we are all familiar with and we know. It is not only the cruelty of the occupier, the inhumanity of the colonizer. It is the pretense of those who support these actions that what we see is not the crime but rather the war of defense, a democratic action, a justified moral policy. We are all familiar both with the double talk, with the language, with the fury, the pretentious fury, the righteous fury that goes along and accompanies the atrocities on the ground. It is this hypocrisy, more than anything else, that symbolizes for workers around the world the way that they are being treated by their employers, by the multi-national corporation and therefore you can see how many people today understand that the fate of the native, who was a victim in a settler colonialist project, is the fate of the worker today and the neoliberal system that we are living in. We will see more and more fusion between the struggle against the inhumanity of shutting a factory causing the end of a cycle of life in the United States and the dispossession of the Palestinian from their villages, water resources, and their homeland. The logic of elimination and de-humanization is not just the logic of political movements. It also is the logic of heartless economic powers that control our life. I think many people, especially in Europe, but I have seen it here in 2008 as well, understand the connection between Flint, Ferguson, Palestine, India, Pakistan, Africa—this is part [applause] ... You are not only struggling against the criminal policy, you are struggling against the narrative that claims that this is not a crime—that this is for the benefit of the people—that the whole discourse that pretends to improve people’s life but actually destroys them is exemplified in Palestine on a daily, if not an hourly, basis. I think that’s why people all around the world see their own struggle so strongly associated and connected with the struggle for peace and justice in Palestine. And I am very hopeful in this respect because I think we were misled by the movement in the United States, in particular, after the crisis of 2008. There was a very energetic response to the crisis—you are all familiar with that—in different towns, in different cities in the United States, and it petered out. Social justice, more than anything else, is a struggle against double talk, against hypocrisy, against exceptionalism, against deception. It is quite ironic that both in England and in this country, the people who seem to represent at least partly, this new young energy, and wish for cleaner politics, for morality in politics, are represented by people who are nearly 80 years old. This is not good. May they live very long but I would have liked to see 20 years old representing these ambitions. I will settle for 65. But there is something in the old values that these two gentlemen represent that the young people recognize as cleaner, as purer, as something that doesn’t have the hypocrisy that politics has. It’s not surprising that in the case of Jeremy Corbyn in England, Palestine is the main issue in which he is attacked and I can assure you if Bernie Sanders would find the courage to go an extra mile of the two-yards that he’s already walked towards us, if he will take the extra mile he would find that Palestine is the issue which will define him very much as any other topic he would decide to bring to this campaign. Finally I would say, and this is very, very important, Palestine is the issue of human rights today. This is the reason, I think, for so many of us, this is such an important historical juncture. And when I say ”us”—I mean Palestinians, people who support the Palestinians, Israeli Jews, anyone who is involved as an NGO, as an activist, as someone who lives there or someone who was expelled from there—for us 2016 is a very critical moment. The Palestinians will have to redefine their project of liberation and adapt it to 2016. It is very difficult given the fragmentation which is the greatest Zionist success. The Palestinians were fragmented to five different groups. Naturally each one of these groups developed its own agenda. But we need a united Palestinian front, we need a united Palestinian Representative bodies. None of the bodies that exist today represent faithfully, the needs and aspirations of the Palestinian. They usually represent a slice of the Palestinian issue and that kind of slice always serves well the Israelis and those who want to harm the Palestinian people. So I think this is the moment where you have to find the way of re-defining the struggle for liberation in Palestine as the most important human rights and civil rights issue in the world. It is possible. The energy you hear from young people all around the world is there, ready to put Palestine at the center, as the symbol for the struggles for human rights, civil rights, and social justice around the world. But you cannot do it without representation which is authentic and unified over the Palestinian people. The second thing that we have to take into account, 2016 should be the time where we all would be invited to the funeral of the two-state solution. [Applause] The body is already in the morgue. Every now and then there is an American negotiator who takes the body out of the morgue, puts some life into it, like Jesus, and makes us feel as if it’s still alive then tells us it’s just around the corner. But apparently that corner is not on Earth. It’s somewhere in Mars. It’s time to stop this charade. Not because it’s right or wrong. Because it really does not allow us to have a genuine discussion about the alternative. You cannot have a serious discussion of a different way forward if you still stick to a formula that is irrelevant, has nothing to do with the reality on the ground, and also is not a just one. In this respect, we have to try and persuade people not to be afraid and say, whether they were genuine supporters of the two state solution, whether they were cynical supporters of the two state solution, it really doesn’t matter. It really doesn’t matter. It’s a time to say, Maybe it could have worked, maybe it was a good idea, one can understand why even some Palestinians strongly supported it. In 2016 it’s a waste of time, it’s a waste of energy, it’s a waste of human effort that is deeply needed, urgently needed for finding a different way forward. You cannot do both things. You cannot protect a failed formula and talk of a new formula, You have to bury the idea that, frankly speaking, is the idea that provided immunity for Israel to kill more Palestinians, to make more Palestinian refugees, to demolish Palestinian life and houses, to take more of Palestine, and to render any just solution even more distant that it was before this ill-thought idea was introduced as the only way forward for peace and reconciliation in Palestine. So Palestine is still the issue because we need new thinking on Palestine. We need fresh thinking on Palestine and it doesn’t matter exactly how you’re going to frame the idea of a one state solution. It doesn’t matter what exactly you bring to the table when you say I want to replace the hegemonic language of peace that has helped Israel to continue destroying Palestine rather than bring peace and reconciliation. It doesn’t matter what you bring to the table. But bring something new to the table and don’t rehash formulas and ideas that only benefitted those who wanted to destroy Palestine, not those who wanted to bring peace and reconciliation. I say this with some depredation because some of our best friends still believe in it. Some of them even religiously still believe in it. But it’s time to talk to them as well and to tell them, We need you on our side. We need every good person, inside and outside, a Palestinian and a non Palestinian, to join forces with us and find out how do we respect the human rights, the civil rights, of both the native population of Palestine and the settler community that now is its third generation? How do we help them to build a political system that rectifies the evils of the past and promises good future life for everyone who is there and everyone who was expelled from there? This is a very important topic and I will end by saying that this is a particularly important issue because I think it is connected to everything that goes on in the rest of the Middle East. We have to remember that before Zionism arrived in Palestine, although there was violence, and definitely there was violence, although there were wars in the Middle East, the two logics I was talking about of de-humanization, of physical elimination, of elimination, were quite strange to the Middle East. I’m not idealizing the Middle East. I am just saying that it was European enlightenment that invented Settler Colonialism that gave license in the name of Enlightenment and progressiveness, the right to de-humanize other people, to the extent that you could hunt them as animals in Australia, and to kill them as if they were not human beings in the United States of America. This is something that is still an open wound and Palestine is the bleeding part of that wound. I think that you have to understand what happens in the rest of the Middle East if you can see that elimination and de-humanization of the Palestinians is not only possible because Israel is strong, is not only possible because Israel has the military capacity to do it. It is possible because Israel has an exceptional treatment in the international community. Because it has a license to ethnically cleanse the Palestinians in 1948 and not one international body says anything. It has the license to expel 300,000 Palestinians from the West Bank in 1967 and nobody says a word including within the more conscientious sections of the western society. So if we want to have—and we need, everybody would agree in this hall—we need, urgently, a genuine conversation about human rights and civil rights in the Middle East. This is the most urgent problem in Syria, in Iraq. The inhumanity of the governments, the inhumanity of the groups that oppose the governments are at the heart of the bloodshed that we see today. Together with imperial interests that exploit the situation in order to increase the flames of the fire rather than to try and bring it down. But you can never have a genuine conversation about human rights and civil rights as long as the exceptionalism of Israel continues. So if you want to talk to Syrians about human rights and civil rights, start in Palestine. Don’t start in Damascus. If you want to talk about human rights in the Yemen, in Libya, start in Palestine. People would then believe that you really care about human rights, about civil rights. And Palestine could be the place where it's not only still the issue but it also can push the issue of human rights and civil rights. And then maybe we will understand why it used to be called the Holy Land. Because now it is anything—it is the Hollow Land and not the Holy Land. And we have to bring it back to its historical, ethical, and moral place in history by having this kind of conversation. So I will end by saying, don't let anyone tell you that the Palestine issue is less important than any other issue. Don't give up on Palestine and the Palestinians. And be brave enough to put aside slogans, formulas, solutions which are irrelevant, that are negative, that are destructive, and join the new energy that we are feeling coming out from many parts of Palestine and Palestinian life that wishes to create normal life, democratic life, human life for anyone who lives between the river Jordan and the Mediterranean and anyone who was expelled from that homeland and wishes to come back. That was the conclusion of a 45 minute speech by Ilan Pappé, Israeli historian, and currently Director of the European Center for Palestine Studies, at the University of Exeter in Britain. He was the keynote speaker at the May 2016 anniversary celebration of the Middle East Children’s Alliance, MECA, a nonprofit humanitarian aid organization based in Berkeley, California. Ilan Pappé was recorded by Jeff Blankfort on May 2, 2016, at the First Congregational Church in Berkeley, California. You can hear this program again for free on TUC Radio’s website, tucradio.org. Look for the Newest Programs page or the Podcast Page. TUC Radio is free and depends on the support of listeners like you. Your donation keeps this program on the air. For more information call 707-463-2654 or go to TUC Radio’s website, tucradio.org for the address and donate buttons. There you can also subscribe to weekly, free podcasts. My name is Maria Gilardin. Thank you for listening. Give us a call.